One of the last futuristic looking EVs you'll probably ever see. Electric cars are the future. Sadly, the future mostly resembles the past when it comes to car designs. Sure, early cars like the Honda Insight and the GM EV1 at least tried to look sleek -- even if it was for the benefit of aerodynamics. There is one company that's decided to release EV vehicles that look like the future though. Or at least TRON's version of it: BMW. The BMW i8 and i3, while on opposite ends of the driving spectrum (a supercar and urban commuter), both look like they belong in a magnificent world of tomorrow; one with greener skies and where everything glows blue and white. Getting behind the wheel of the latest version of the i3 with Range Extender (yeah, that's the actual name) might have felt like sitting in a concept car at an auto show, but it's a car you can actually buy. The bubble-like vehicle is more than just a designer's whimsy brought to the road. It's a solid, town-friendly EV that's not quite pure electric and not quite hybrid. 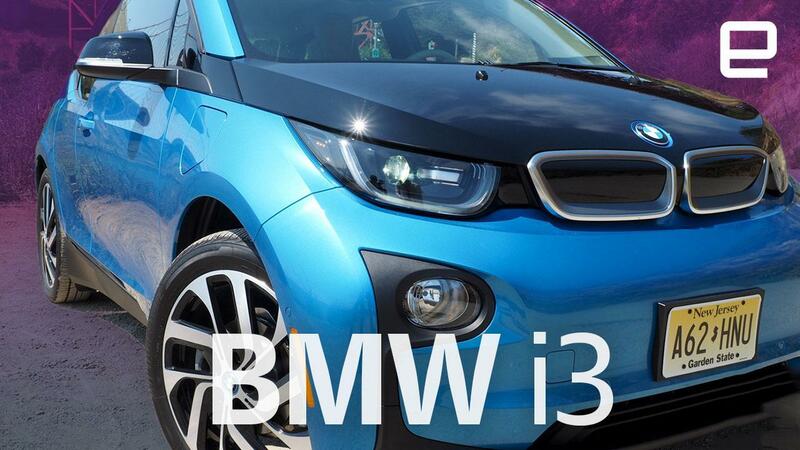 The $48,300 i3 with Range Extender sports a 33 kWh battery that delivers a 90-mile range. It also has a tiny scooter engine in the back of the car that kicks in once that battery is nearly dead. But instead of powering the wheels, like other hybrids, it keeps the battery pack from becoming fully depleted, and that combination can keep the car on the road for up to 205 miles total. This means you get the same EV torque driving experience you've come to expect from an electric drivetrain and after you run down the battery you can hear that scooter engine (it's an actual scooter engine from the C600) from the trunk. It's faint and it sort of blends into background of road noise after a few minutes. The effect on how you plan your drive could be substantial. For example, if you didn't charge the car the night before and need to drive beyond the range of the battery, you can, knowing a simple trip to the gas station (to fill the Range Extender tank) will get you out of any sort of jam. The i3's Range Extender is definitely not made for any sort of extended road trip, though, thanks to its teeny-tiny 2.4-gallon gas tank. You should get ready to stop every 60 miles for a refuel if you're doing highway driving. But that's not what the i3 is built for. It's made to drive around town with occasional trips outside your local area. Had BMW put a 5-gallon gas tank on the Range Extender, that would have doubled the extra miles from the generator, which would have been nice. If you're still keen on reducing any use of fuel by the car, the i3 comes with DC fast-charging as standard. As long as you can find one of those stations in your local area, you can go from zero to 80 percent in about 45 minutes. Regular Level 2 charging will fill the car with electrons from zero to 100 percent in about four-and-a-half hours. 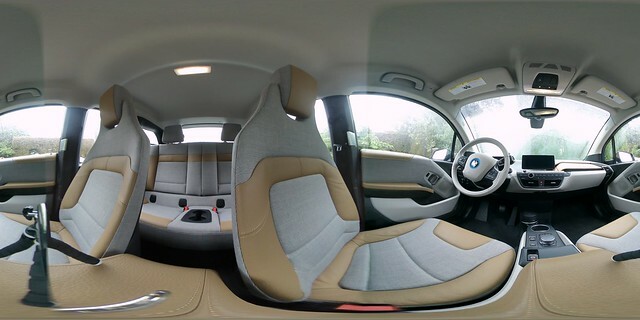 The i3 covers pretty much all your bases when it comes to keeping it on the road. That includes aggressive regenerative braking that can make initial experiences behind the wheel feel a little odd. The first time I drove the car in Eco Pro mode, I was pulling out of a parking space between two cars on the street -- I gingerly depressed the accelerator, and nothing happened. I assumed I had forgotten to turn the car on, or maybe I accidentally turned it off. The sometimes unnerving silence of an electric can lead to a few moments like that. I also checked the parking brake. Turns out, I just wasn't pushing hard enough on the accelerator, and when I did get it moving, it felt like I was driving through molasses. Once you get on the open road and punch it, the 184 foot pounds of torque rears its head. It's not the quickest thing on the road, with a zero to 60 of eight seconds, but off the line at stop lights, it's got enough gumption to get ahead of other drivers if they're not in the mood to race. Once you get used to the regenerative braking bringing the car to a full stop on flat surfaces when you take your foot off the accelerator, you realize that driving only using one pedal is kinda cool. More important, thanks to all the energy reclaimed by the car slowing itself down, it takes a while to deplete the battery during regular city driving. Normally after a few trips to work and driving around on San Francisco's congested streets, I'm looking for a charging station. The i3 just kept going though. I actually had to venture across the bay and hit the highways to finally hear that tiny generator fire up. It's on those freeway jaunts, though, that you're reminded that the car is really at home zipping around on surface streets; it's not so much fun at speeds above 50 miles an hour. The car's small yet tall shape means that cross winds and the turbulence of passing trucks make driving an ... experience. The tight steering and suspension also lose their charm once you get out on the open road. It's the curse of the small car. Still, at the premium price of the i3, I feel like that steering should be tighter in that type of environment. That's the biggest complaint about the i3 -- if you're a fan of the design -- the price. Yes, it's a BMW and you should expect to pay a premium. But it's in a market where the Chevy Bolt and Tesla Model 3 have more range and cost less. Those two cars will disappear in the sea of metal flowing down the roads though the i3 sticks out. Its polarizing design ends up being the topic of conversations more than its range or its cost. With an exterior from TRON and an interior ripped from a Pottery Barn catalog, the i3 can't be ignored, and it'll be a sad day when it disappears once all of the regular BMW's have EV counterparts. The BMW i3 with Range Extender is cool-looking to some and hideous to others. It's what happens when the concept car you see at the unveiling actually ends up in showrooms. And, love it or hate it, the car world would be a better place if more automakers took a chance on what they were bringing to the future of driving. Just because you want to drive green doesn't mean you want to drive the design equivalent of beige.